Exciting News About "Check for Bikes" Clings! We’re excited to report that we have two new partners in our “Check for Bikes” safety initiative! Alameda County Transportation Commission wanted custom clings bearing the image of a woman on a bike. It’s wonderful to see this transportation agency helping spread the word to keep an eye out for bicyclists when you’re driving! 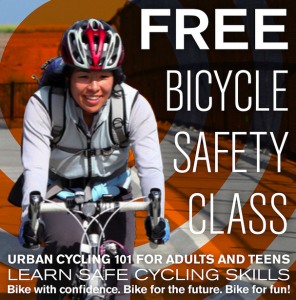 Pass on the Gift of Bike Safety for the Holidays! The original “Check for Bikes” cling, AS&R’s latest safety initiative. What is it?Go to http://checkforbikes.org/ to find out more! “Bike Bike Racks” 3.0 in Albany! Any doubt whose rack this beauty is? Yes, Charlie Prins Chiropractic co-funded this rack, along with AS&R and the City of Albany, but neighboring businesses are welcome to use it! 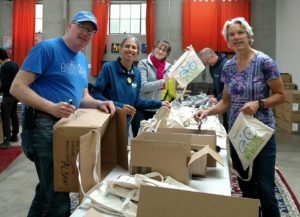 Missing Link Distributing "Check for Bikes" Clings! ¡AS&R Designs First "Check for Bikes" Clings en Español! AS&R Funded New Bike Racks now at the Waterfront! The new Dero “Recycle Circle” racks at the Waterfront Cove are getting good use already! Soon decomposed granite will be laid around them for a level and clear approach, but for now they look great! 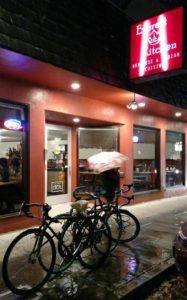 Two More Businesses Carry our "Check for Bikes" Clings! 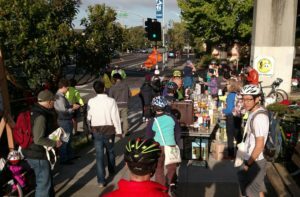 We want YOU at Bike Month Events! 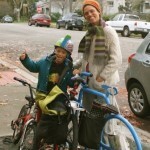 Albany Strollers & Rollers is considering launching a bike trailer sharing program. We would like to help people use bicycles for tasks that they might have thought required a car: transporting children, groceries, equipment, or even Christmas trees. More "Bike Bike Racks" Around Town! The racks at St. Alban’s Church have gotten plenty of use already!